Are Republicans Really That Excited About A Debt Limit Brawl? There are plenty of conservatives who can't wait for a knockdown brawl over the federal debt ceiling this spring. As South Carolina Senator Jim DeMint put it, "We need to have a showdown, at this point, that we're not going to increase our debt ceiling anymore." Likewise, three GOP presidential hopefuls (Tim Pawlenty, Newt Gingrich, and Mike Pence) told The Wall Street Journal today that they opposed any lifting of the debt ceiling by Congress unless it was accompanied by strict spending cuts. "Let's call their bluff," enthused Pawlenty. But it's striking how much less excited the Republican leadership in Congress sounds about a staredown with the White House. At a briefing with reporters this afternoon, House Majority Leader Eric Cantor tried to lower the temperature a bit. "What we've said all along—and over the last several days for sure—is that the debt limit vote is an opportunity for us to live up to the commitments of reform." 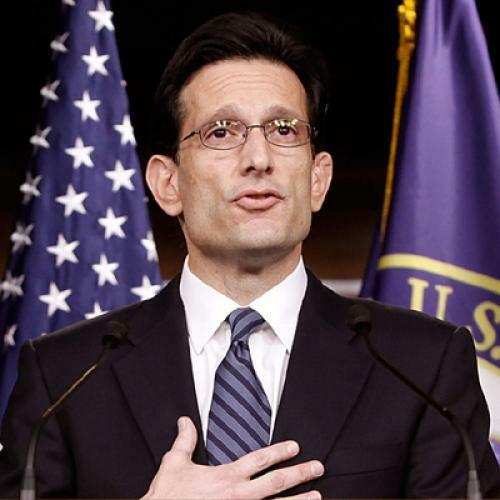 The GOP caucus, Cantor said, "needs some assurances that things aren't going to be the same." Okay, but how far would Republicans really go? Here Cantor picked his words carefully. "There are serious consequences to the vote on the debt limit on either side," he said. "The president is commander-in-chief, he is obviously interested in making sure that the government continues to provide the functions that it provides for this country… and we certainly want him to." When another reporter asked if the House would realistically prevent the debt ceiling from being raised, Cantor backed off even further: "I didn't say that. I don't want to opine one way or the other. All I said was this was a serious vote." Couple that with what House budget chair Paul Ryan said the other day: "Will the debt ceiling be raised? Does it have to be raised? Yes." That's a long way from "Let's call their bluff." Richard Nixon, of course, had his madman theory of international relations—act like you'll do anything, no matter how crazy, to bolster your bargaining position. But at least so far, we're not seeing a lot of that from the House leadership. P.S. By the way, here's a good primer from Stan Collender on what would happen if the debt ceiling isn't raised. Short version: The United States wouldn’t default right away, and the federal government wouldn't have to shut down—at least not immediately. There are all sorts of tricks the Treasury Department can pull (like slowing payment to government contractors) to keep things running for months.